So, what’s up in the garden? We’ll talk about the (mostly) pretty stuff in this post, and I’ll give a forewarning about the next post (which will cover a topic I find fascinating, and which most of you may wish to skip). 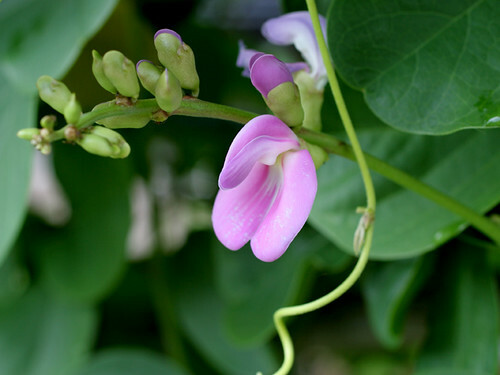 Canavalia rosea, otherwise known as the bay bean, beach bean, seaside jackbean, coastal bean or Mackenzie bean is an important plant for control of beach erosion. I’ve often marveled at the lush foliage and quirky flowers of this plant when I found it growing on the sand dunes. Last year I became very interested in the plant and learned that it is a severely underrated, hardy and drought-tolerant ground cover. 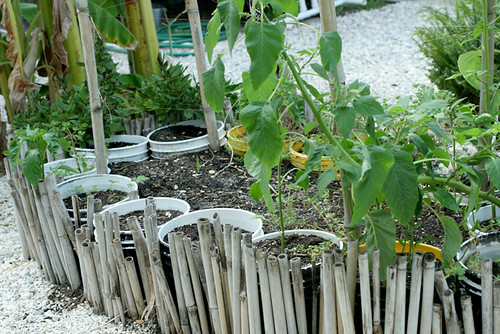 I decided that it would be the perfect plant for our barren “Back 40”, and resolved to acquire some beans to plant. As though I had placed an order, Mike (the guy who pays us) who had been harvesting beans from the beach, and growing these plants in his garden, gave me some seeds. He also mentioned that he enjoyed eating the beans, prepared the same as edamame. 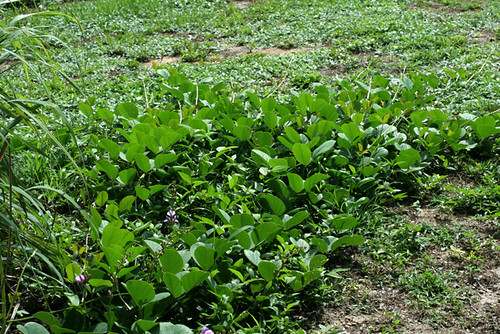 Research gives mixed results about the toxicity of these beans and suggests that they should be thoroughly boiled (if eaten at all). He shared some seeds with me, which I planted this spring. The vines have since grown to fill my trellis and are blooming and creating beans. I’ve also begun training them to grow out on the Back 40″. My next step is to get some native beach daisies and gaillardia to intersperse with the bay beans. I’ve seen this at Sebastian Inlet, and it is not only appealing, but attracts native pollinators. 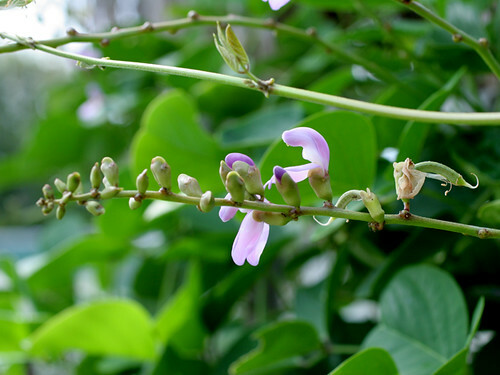 I would be remiss if I failed to mentions that Canavalia rosea is a psychogenic herb. In other words: People have used it to get high. 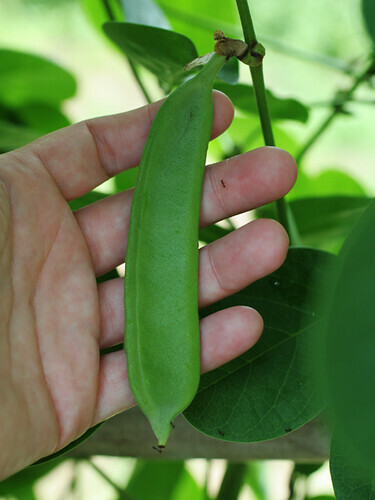 I cannot vouch for this quality, but I have noticed that my bay bean plants are conspicuously absent insect damage. Maybe the bugs take a bite and then forget where they are? Whatever the reason, this plant is thick, healthy and exuberant, despite the root knot nematodes and abundance of destructive insects in my garden. 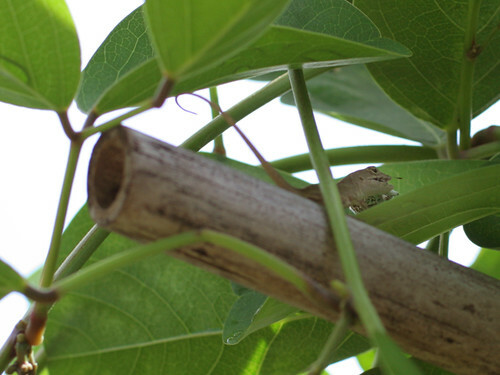 I’ve also discovered a treasured Carolina anole living in its canopy, as well as a marked reduction in the number of aggressive brown or Cuban anoles. Today I found an exception to this generalization as I was following a small, blue butterfly with my macro lens; hoping for it to light on a blossom for a photo op. Before the butterfly could land, it was snatched up by a juvenile brown anole, which proceeded to dispense with it in a few hearty gulps. As healthy as is the bay bean, the rest of the garden is struggling. 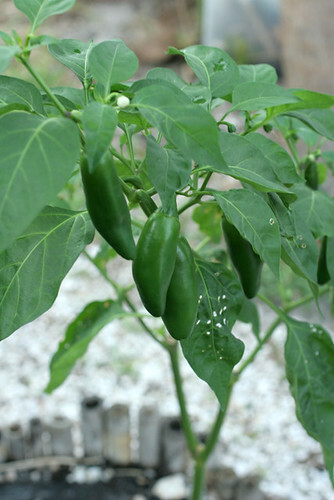 My best producers are the Jalapeños grown from the seeds of a produce market pepper. I’ve shared many of these peppers and have made some hot sauce that I think is pretty darn good. Despite the obvious damage of pests and the dreaded root-knot-nematodes, these plants continue to offer up their picante prizes. Today, I was reminded that insects and nematodes are not the only culprits responsible for the weakened plants in my garden. 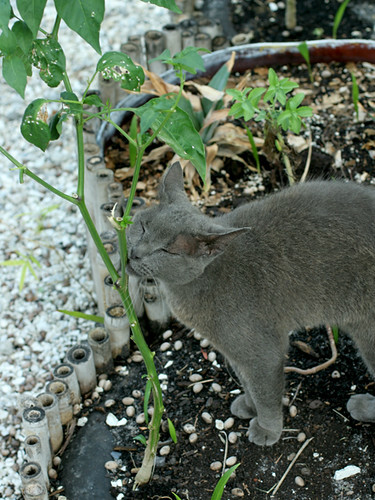 Smokey makes sure everyone knows these are his plants. 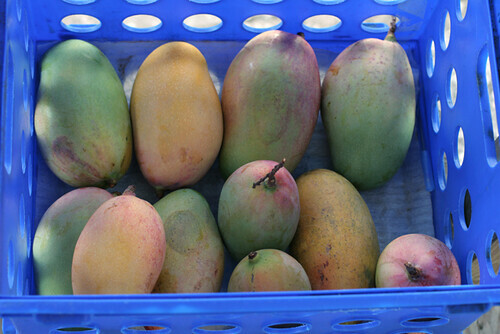 The heat, drought and root knot nematodes have conspired to ensure that we pay cash for our produce. The bamboo fascia around the Oasis is also rotting and falling over. This repair is one of many projects on my procrastination list. In hopes of getting our own place in the near future, I’ve let things go to seed (literally). The amaranth you see in the foreground is a volunteer from last season’s experiment. But something I learned today has given me a new found sense of encouragement. In order to find out what this is, you’ll have to read my next post. I warn you to avoid eating immediately before or during such reading.